The Shrine of Our Lady of Pompeii is participating in the Archdiocese of Chicago’s Renew My Church initiative. This Archdiocesan wide initiative ‘will chart the course for greater vibrancy and vitality’ in the Archdiocese of Chicago ‘for generations to come’. (Above is a photo of The Shrine’s Cross of San Damiano). Carl Waschmann is the coordinating ambassador from Our Lady of Pompeii to the neighborhood grouping. Please contact Carl for further information or any questions you might have. He can be reached via email or at 312.421.3757 x315. at Notre Dame de Chicago, 1335 W. Harrison, 7:00 – 8:30 p.m. Please click here to Link to Archdiocese of Chicago’s Renew My Church web Page. There you will find further information. Image of the San Damiano Cross (above). While praying in front of the Cross of San Damiano, St. Francis received his commission, from Our Lord to repair His Church. St. Francis first concentrated on repairing the Church of San Damiano. After that St. Francis founded the Franciscans, thus continuing his mission. The name of the artist who created the original Cross of San Damiano is unknown, but likely an Umbrian artist of the twelfth century. The Cross, like all icons, bears great symbolism, and in that symbolism there is teaching and understanding of our Catholic faith. The Cross of San Damiano may have differing iconographical images. Some images are the same. The Shrine’s Cross of San Damiano hangs above the tabernacle in our sanctuary. It is a very generous gift of Joseph and Sarah Sepe. We are most appreciative of their generosity. The Shrine’s San Damiano Cross is visually stunning and major iconographical images are described below. 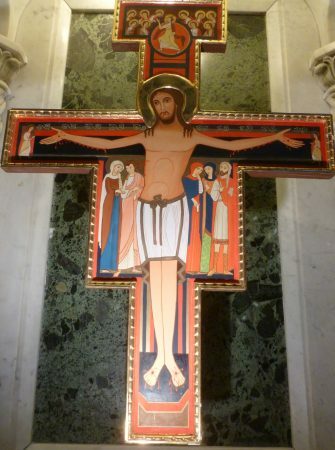 The most significant image on the San Damiano Cross is Christ. Christ bears the wounds of His crucifixion and of our salvation. Christ’s face does not show the pain of the crucifixion, instead He gazes out, warmly and lovingly at us; the onlookers, witnesses and beneficiaries of His suffering and death. His resolute face reminds us in the hope of the Resurrection. His hands and His feet are not torn from the nails of the crucifixion. Instead they are ready to embrace us and walk with us. Around Christ’s body are two figures on His right and three on His left. The two figures are Mary, the Mother of God, and St. John the Evangelist. The three figures are St. Mary Magdalene, St. Mary Cleophas, and the Centurion. Above the figure of Christ is the Ascension of Christ.